The Target Mini is so cute you will feel an overwhelming urge to toss aside all your other devices in favor of this fantastic and tiny mod! This miniature and palm sized device might be cute as a button but don’t let its size fool you! The Target Mini is a mod kit that can tangle with some of the best! 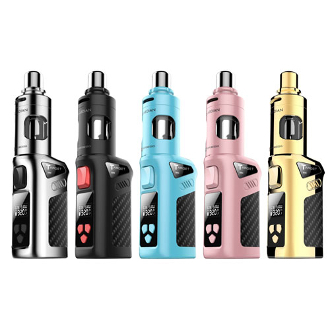 It has three output modes: Variable Wattage, Variable Temperature, and TCR. The wattage ranges from 5-40 Watts, while the temperature ranges from 200-600 degrees Fahrenheit. The Temperature Control Mode supports Ni, SS, and Ti for a more precise and flavorful taste of the users favorite e liquid. With a built in 1400mAh battery you will have plenty of time to enjoy vaping. And when it does come time to recharge it, the kit comes with a micro USB Charging Cord that allows the Vaper to use it and charge it at the same time. The battery life can be seen with just a glance at the digital menu display. The OLED display screen also shows off your wattage/temperature level, your mode, and your ohm resistance. Sitting on top of the Target Mini Pro Mod is the Guardian Tank. The Guardian Tank was design to offer customers to styles of Vaping: Direct to lung and Mouth to lung. The Kit comes with two coils a 0.5 Ohm and a 1.5 Ohm. Remember the lower the ohm the more vapor production capabilities. The Guardian Tank has a double child proof locking mechanism, hence its name, and can be filled with ease through the twist of the top. Vaporesso also claims that it's a completely leak proof design and is great for those who want a cleaner vaping experience.